Korgollo Major and Minor are the two orbiting moons of the gas giant Myryakur. They are always paired together because they orbit around Myryakur together. 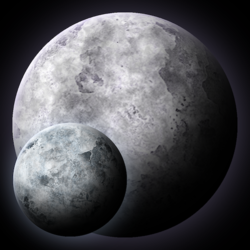 As the moons orbit the planet, they also orbit around the center of mass between the two of them. This paired orbit has led to the locals of the system referring to them as the Dancers. Collectively, the two paired moons orbit Myryakur at an average distance of 1,350,000 km, with one full orbit taking 217 standard days. The ‘dance’ itself of the two moons takes place on a shorter time scale, of 10.5 days. They stay a constant distance away from each other at 15,830 km as they both orbit their centres of mass. 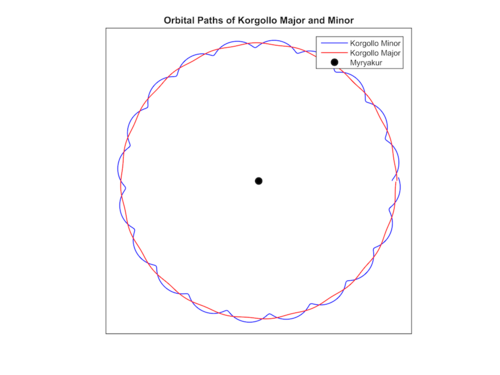 Korgollo Minor takes a much longer route around the centre of mass due to its smaller size. This page was last modified on 11 June 2017, at 16:47.